Roufusport Kickboxing Association: Become an Affiliate Today! 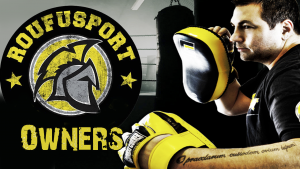 Join the Roufusport Kickboxing Association today! Help and retain more students! You can become part of the fastest growing, most complete kickboxing affiliation in the world, the Roufusport Kickboxing Association! Take your Martial Arts Academy’s Striking Program to an elite level, and well beyond by becoming an official affiliate member of the Roufusport Kickboxing Association (RKA). World Champion Kickboxer, Legendary Coach and Co-owner of Milwaukee, Wisconsin’s famous Roufusport MMA Academy, Master Duke Roufus, welcomes you to join him in teaching the proven “Roufusport Kickboxing” method in your school(s). ==> Increasing student retention by increasing their proficiency and love of your martial arts community, equals: A huge increase to your school’s bottom line. First, your students will be getting taught the exact proper techniques, drills and overall curriculum Duke teaches his students and fighters on a daily basis at Roufusport Headquarters in Milwaukee, Wisconsin USA. Secondly, and most importantly, your affiliation means you’re part of a very special close family of like-minded individuals committed to being the absolute best at their craft. With over 40 years in the sport, Duke knows what works and what doesn’t. He is saving you precious time and money. You now benefit by using a kickboxing system developed by one of the game’s true icons. In addition to Duke’s specialized, proven, and easy-to-follow online instructor training videos in the private RKA owner’s area of Duke Roufus Striking University (DRSU), your membership in RKA gives you access to a full line of official training equipment, apparel, belt level certificates, instructor and fighter training, special seminars and much, much more, all included or at special wholesale prices that will definitely impact your bottom line to the maximum. In today’s society, actions speak louder than words, and Duke Roufus is known and celebrated worldwide for producing some of the most innovative, exciting and successful strikers to step inside a ring or cage. This is your chance to learn from a true master of the sport, who’ll not only become your business mentor and set your striking program on a path to excellence, but Duke will also become your life coach, someone you can call a friend well beyond your affiliation with Roufusport. RKA was founded by Master Duke Roufus to provide a comprehensive support network to help kickboxing instructors and school owners grow their schools and provide quality martial arts instruction for men, women and children. Our team works hard on developing and implementing the Roufusport method of kickboxing instruction. Our cutting-edge and proven curriculum, unique training philosophy, and well-structured classes make it easy for RKA instructors to create a positive and friendly environment for teaching kickboxing to everyone! Are you passionate about kickboxing and martial arts? Do you see yourself playing an important role in your community by establishing a successful martial arts school? Do you need to earn more money at your school? 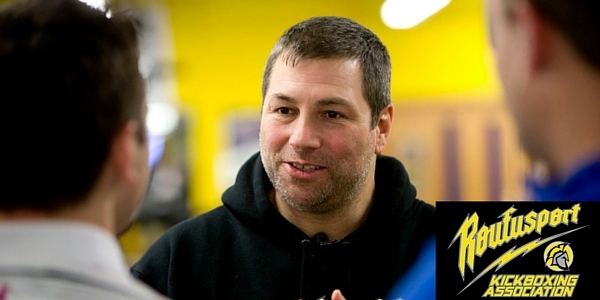 If there’s one person in the United States that’s synonymous with world class Kickboxing Coaching, Instruction and Promotion, it’s Duke Roufus. Since the age of 4, Duke has been honing his skill at becoming the best Martial Artist he could be, winning many titles along the way, including 4 World Kickboxing Championships. Duke even sports a 2-0 professional Boxing record on his already impressive combat sports resume. Coming from a family of legendary martial artists, Duke Roufus has repeatedly brought honor, fame and respect to a combat sports lineage that dates back to the early 1970’s. Always evolving, Duke has become one of the world’s most respected and sought after striking coaches in the game today. The Roufusport Kickboxing Association allows you to bring Duke’s global knowledge, highly sought after curriculum, and proven training style to your school’s mat almost immediately. Tap directly into the mind of Master Duke Roufus by becoming a Roufusport Kickboxing Association affiliate today. Duke Roufus wants you and your academy instructors to have the tools, instruction and ability to offer the world’s absolute best Kickboxing curriculum to your current and future students. RKA class curriculum is based on keeping all students safe while progressing upward through the military based level system based on attendance. As students learn and become more proficient both offensively, and most importantly, defensively, only then will they begin to learn how to spar. We refer to this as “step sparing” and it’s a great way to introduce your students to live sparring while keeping them safe. While competition may be an option some of your students might pursue, the vast majority will be extremely content enjoying the many health related benefits the classes deliver, while at the same time, earning recognition and rank for personal achievement, developing a new community of friends and genuine passion for a new sport – all important components that lead to less churn and overall higher retention rates. Roufusport Kickboxing Association is an outstanding organization focused on providing the highest level of Kickboxing instruction as a tool for individual growth, as well as, strengthening of families and communities for people of all ages, genders and backgrounds. While this definition may seem obvious for those familiar with the organization, RKA’s unique philosophy and vision inspires its instructors, administrative staff and other members, to embrace the ambitious challenge of bringing Roufusport’s martial arts based philosophy to as many people as possible or, using Master Duke Roufus’ words, to “instill the excellence” Roufusport is known for in each and every instructor and student. From the moment you decided to become an official RKA affiliate owner, the challenge of excellence will be your driving force. Like the many people who came before you, your life will be partially or fully dedicated towards the accomplishment of that vision. When your RKA Application is approved by Duke Roufus and you join RKA, you are certified to begin teaching Roufusport curriculum and awarding student’s rank based on our visit based system. Complete Curriculum and Class Plans are available on RKA’s online platform inside DRSU. All RKA affiliates are given an initial guided “tour” of all online content, and support is only a call or email away. 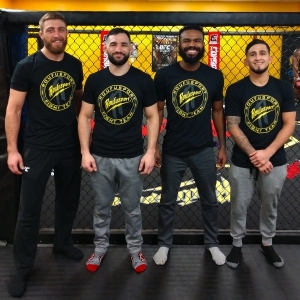 RKA Affiliates are encouraged to visit Roufusport HQ in Milwaukee, WI as often as possible, along with your instructors, fighters and students, and train alongside the Roufusport Fight Team and in our full slate of classes. These visits are complementary and included with your affiliation. In addition, you’re welcome to consult with Roufusport HQ’s Front Desk and Administrative staff as often as you’d like to learn how we operate, our sales procedures and systems, how to set up a successful and profitable Pro Shop, plus many other beneficial tools we use to improve sales, lead generation, retention and our overall bottom line. Roufusport Kickboxing Association is a high achieving community of Kickboxing instructors, students and athletes. Our organization is represented by some of the top Kickboxing academy’s in the U.S. and Canada. • Use of the Roufusport Kickboxing Association Brand in your school and in marketing and advertising collateral. 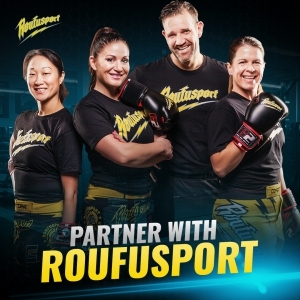 • Roufusport is recognized by the Kickboxing, MMA and Martial Arts community as a whole as a powerhouse for world class fighters and instructors. Your school is encouraged to piggyback off of this success as an official Roufusport affiliate. • Roufusport is recognized as a well structured, professional operated, family oriented business, run by people living within the community. • Phone consultation, when needed, from Duke Roufus and Scott Joffe, Roufusport’s founders. • Special Affiliate Wholesale Pricing on branded apparel and equipment (see below). A profitable Pro Shop is a very important part of the operations of our Roufusport Kickboxing Association member schools. Students and their families wear Roufusport branded training and leisure apparel with pride while helping promote the Roufusport lifestyle in their communities. Member schools have access to training and relevant information on how to operate a RKA Pro Shop and have access to all Roufusport products at wholesale prices. In addition, RKA affiliates are able to quickly set up wholesale accounts at Combat Corner, our official equipment and gear company. To help Affiliate schools implement the Roufusport Kickboxing Association System, or answer any questions or concerns you may have, email and phone support is offered 24 hours-a-day to all official RKA Affiliate owners. Our goal is for you to be highly successful and enjoy your business more than ever while you help more students. • School Support Online Library: A continually updated database of videos and files to help schools manage and run a successful RKA program. Here, instructors can find attendance cards, rank system information, curriculum, class plans, and much more. Every RKA Affiliate school will receive access to marketing campaign advertising templates and implementation support. These campaigns aim at creating new traffic, and reward existing students for referrals and school support. The campaigns come with several items including social media and website banners and graphics, poster and flyer .pdfs for posting and distribution at the school and more. To help our schools promote Roufusport Kickboxing in their communities, Roufusport, along with the web marketing gurus at 97 Display, have put together a comprehensive and effective school online marketing program. The members who opt to join the program receive an impressive RKA branded website customized to your school, Search Engine Optimization Support, and much more. The most evident benefit is to be able to train with many other instructors and students when traveling to cities where an RKA affiliate is located. Your students will love the experience you’ll bring back to them after each visit to train at another RKA Affiliate school! Many of our Affiliate school owners and instructors find it very beneficial to stay connected with other RKA school owners and instructors to exchange information, train together and build a strong base of teams and competitors for RKA hosted tournaments and events. To become a part of the Roufusport Kickboxing Association family, one must comply with the set of rules and principles of good management and teaching practices established by RKA and it’s Agreements. • No Minimum Affiliation Term: You may stop or put your RKA affiliate ownership on hold at any time, there is no minimum term requirement. We do ask for 10 days written notice in advance of any scheduled payment draw. • Monthly Fee: All Roufusport Affiliates School owners pay a Monthly Fee of $297 on the 15th of each month to maintain RKA membership benefits. No enrollment fee is required. A Yearly Fee Option of $1,997 is also available. This fee may be broken into two $1,000 payments within a 30 day period of becoming our affiliate. • Attendance Based Rank Program: Roufusport Kickboxing Association school owners have a choice to implement and use the RKA attendance based rank system established by Master Duke Roufus. You may also use the RKA curriculum in a non-rank class situation, as well. • Roufusport Kickboxing Association Training Uniforms: No uniform is required of schools using the RKA attendance based rank system. RKA has rank certificates available for purchase for school owners who want to award rank to students. In addition, Roufusport apparel ordered through the RKA’s owner’s Pro Shop or by calling HQ come with the option to have your school’s name and/or logo added. Wholesale pricing is available to all RKA Affiliates on apparel and equipment for sale to students and for personal use. • Roufusport Kickboxing Association Affiliate Etiquette: As a RKA Affiliate school or instructor, you are also an Ambassador of RKA, be it in the academy or elsewhere. All RKA Affiliate school owners, instructors and students must treat each other, family, friends, coworkers, fellow competitors and the general public at large, with the utmost respect and highest degree of sportsmanship and sense of fair play, at all times. Actions that cast any RKA Affiliate school or instructor in a negative manner, while failing to uphold the highest of standards as established by RKA could result in the Affiliation being revoked. Join Now! Apply to Become a Roufusport Kickboxing Association Affiliate Today! Access to Master Duke Roufus’ legacy of over 40 years Martial Arts experience and the Roufusport brand is now yours to exploit, utilize, take advantage of, learn from, grow and prosper, both as a Martial Artist, and as a person. applying for your RKA Affiliation now.